Pawar Travels provide you cab facility from mumbai airport to shirdi, the land of Sai who resided in Shirdi a small village in kopargaon in Ahmnednagar district. Specially Sai Baba is worshipped on Thursdays , mostly on this day number of Devotees visit Shirdi for darshan. The total distance from mumbai airport to shirdi is 244 km which takes 4h and 35 min to reach by a cab. While going from mumbai airport to shirdi we find number of places to get freshen up and some hotels to have some snacks and various fueal pumps newly opened ccd’s sweet homes and various other things. The temple timings are the temple opens early morning at 5:15 am with Kakad aarti and remains open till the end of Shejarti. Today Shirdi is a big town with all morden amenities buildings and shop a well known pilgrimage center. Sai baba resided at Dwarkamai till the very end of his life. As you enter into the temple Dwarkamai is situated on the right side of the entrance of Samadhi Mandir. The Main attraction of Dwarkamai is the oil Painting of Sai Baba Sitting in a Carved Wooden shrine. The Three main festivals which are celebrated in Shirdi are of two to Four Days each. They are Ramnavani , Guru Purnima and Vijaydashmi these festivals are celebrated with a great Devotion which includes bhajan and many other activities. The Khandoba Mandir is situated on the main road, In this temple there are three icons of Khandoba, Bani and Mhalsai. Khandoba Mandir holds an importance in other way too which is 15 feet long and 15 feet in breadth remembrance with a small Shrine and Padukas as its base. The Samadhi of Sai baba is build with white marble stone. The Temple has a large assembly hall where around 500 Devotees can be accommodated . The Temple is kept open overnight only during special occasions like Guru Purnima , Dassera. Other than that On every Thursday and on each festival, a Palkhi with Sai Baba’s picture is taken out from the temple. Sai Baba Museum in Shirdi is a rich monument where all the things that were associated with Sai baba is kept . The Museum also has a grinding mill kept safely which sai Baba used which has its own significance like the Dharma and Bhakti which brought people together. 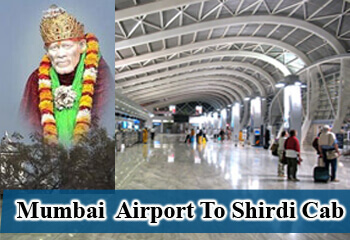 The Mumbai airport to Shirdi taxi fare is as per km and taxi requirement.